JR Smith reacted to Kyrie Irving’s decision to call and apologize to LeBron James following their infamous breakup in Cleveland last year, which eventually led to the Cavaliers’ downfall. Smith took to Twitter to express his thoughts on Irving reaching out to James. His tweet looked like a praise for Irving because of showing that he has matured now that he is also trying to lead a young team in Boston. Irving confirmed on Wednesday that he reached out to James after a dismal loss to the Orlando Magic on Saturday. 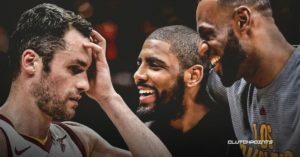 The All-Star guard admitted that he realized why James was so hard on young guys, including him, during their time together in Cleveland, which only lasted three seasons after Irving asked for a trade. The Boston Celtics superstar also sought James for advice on how to get the best out of younger players. Irving appreciated James’ effort to instill a championship mentality to the Cavaliers when he decided to return to Cleveland in 2014. According to an earlier report in Cavs Nation, All-Star forward Kevin Love also lauded Irving’s growth. He actually revealed on The Athletic that he was with James when the call happened. The report also revealed that James appreciated Irving’s action, while Love empathized with Irving’s struggle when he was still in Cleveland.